Missy 7's Story . . .
Missy continues to blossom in her foster home. She is a loving, sweet, well behaved lady who is high on life. Want to go for walks, cuddle on the sofa and watch TV, go for a ride in the car or just sit in the yard and watch the world go by? Well, this is the girl for you. Missy loves all of these things. Her house manners continue to be excellent, and she gets along with all the dogs, cats and people that are now part of her life. She will even play with the puppy next door until he gets too rough and then she simply leaves. Missy loves to play hide and seek in the fields of soybeans surrounding the house, and, if no one will play, she will amuse herself with smells and wandering. She will follow airplanes, helicopters, or any "flying object" as if it were a bird in flight! She is so focused that she just won't take her eyes off it until it's gone. Missy is not a barker except when she feels she needs something……….a treat, walk or just some attention. She will pat the floor with her foot and give a couple of barks. If it is too cool or too hot in the house, she will pat the floor registers to let you know to adjust the thermostat. Missy has a book full of little things such as this to keep her people well entertained and on their toes. She is just so cute!! This spunky senior recently received an ultrasound in an effort to help with her incontinence. The vet reported the ultrasound showed the presence of small masses on the bladder wall. These could be benign polyps or early transitional cell carcinomas, an aggressive form of bladder cancer. Missy had no evidence of infection at that time, and her foster mom feels these masses could be causing an irritation to the bladder wall or some retention of urine leading to the incontinence. After she was started on a medication which may reduce the polyps, Missy’s incontinence completely disappeared. Her medication for incontinence has been changed to one that can be given less frequently. This little bundle of sweetness has the most precious smile that just shows how grateful she is for MAESSR's help. Without a doubt, she will be even more grateful when that special person steps up to offer her a family to call her very own. Could that be with you? 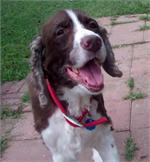 Opening your heart and home to a special senior Springer is one of those things that could really change your life. It could, undoubtedly, also change Missy's. Missy is doing great these days; her ears are cleared, and she is completely healed from her surgeries. Treatment for her UTI should be finished in a week after which she will be tested once more to make sure all infection is gone. The meds for her incontinence are working well, and her foster mom reports no problems for at least a week. This little girl’s personality is beginning to emerge and it is very cute. If dinner is not being fixed fast enough, she will pat the kitchen cabinet with her paw to let her foster mom know, “This is taking too long.” If things are not going her way, she will stomp her paw and give her mom that little look. If she is ignored too long, she will stomp her foot and bark, giving you that little Springer smile. Missy loves small children and will follow them everywhere. She doesn’t jump or push; she just wants to be near them. She loves all people but is not pushy about wanting attention. Just being near folks is enough for this sweet girl, along with a couple of belly rubs per day! During the day, Missy takes over the sofa, rearranging the pillows so she can rest her head and keep an eye on her world. At night she still sleeps beside her foster mom’s bed cuddled up with another foster pup. Missy will make someone a wonderful companion when she’s ready to leave her foster home, and her furever family will be blessed to have her. Original: "A true Velcro dog, Missy needs to help her foster mom with all the household chores, in addition to overseeing the comings and goings of the other critters in the home." Missy came to MAESSR when her Virginia family could no longer afford to care for her ongoing health issues. When the medications and vet bills for even routine care became an issue, the family enlisted MAESSR’s help to find this sweet little girl another home. Missy has been incontinent since age 5 and on an inexpensive medication with good results; her foster home has not seen a problem in this area. She is a sweet loving gentle girl, spreading happiness and joy wherever she goes. A true Velcro dog, Missy needs to help her foster mom with all the household chores, in addition to overseeing the comings and goings of the other critters in the home. This is a lot of work for an 11 year old dog, but Missy has no problem with her duties and would not think of giving them up to anyone. At night she sleeps on a quilt beside her foster mom’s bed and during the day will nap on the sofa or a quilt on the floor. Missy is quite an active girl and loves going for a walk or run in the fields next to the house. She has good recall and does not wander far from her humans. She pulls just a little bit on her leash, but since she is a petite gal, this is not a problem. This beautiful senior is not a couch potato--the busier the household, the better she likes it. Her house manners are excellent, no counter-surfing, trash diving or getting into inappropriate things for this lady. She tries to beg, but will go lie down when told unless she decides to play the hard of hearing card. Funny girl! Missy gets along with all the dogs in her household and with dogs she meets along the way while outside, but is for the most part disinterested in most of the four-legged housemates. She saves her attention for the two-legged ones who just may have something she wants from time to time! Although she has not shown interest in toys to date, she loves to sit and watch the other dogs play. While sometimes a little restless in the car, Missy will jump into the van every chance she gets since going places is one of the things she enjoys the most. She is always happy to see the very small children next door, greeting them with wagging tail, but at her age she should not be ask to live with them. During her first 10 days with MAESSR, Missy was brought UTD on bordetella, had her ears treated for a bacterial infection, had a mammary mass removed, and was started on high quality dog food with supplements for her dry skin. Missy endured all of this like a trooper and today is doing very well. However, continued monitoring of her surgical site, adjacent skin and mammary gland and regional lymph nodes must be a part of her future care to guard against recurrence of the early-stage malignancy. Check back for updates as Missy finishes her treatments for her health issues and gets ready for a forever home.